Sesame is called ‘Ellu’ in Tamil and ‘Til’ in Hindi. 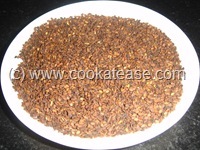 It is mainly cultivated to extract sesame cooking oil. In south India, sesame is used in some curries and its oil is used in making pickle in addition to cooking. Sesame oil is also used for bathing and oil pulling. In day to day puja, sesame oil is used to light lamps. In Tamil cuisines it plays a vital role due to its medicinal value and less cholesterol content. 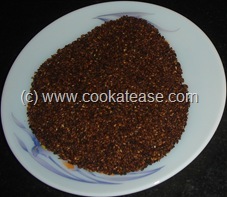 Sesame contains more calcium, iron and is used in making laddoo and chikki. In Indian mythology, it plays an important role, as sesame is used in Tarpana (rituals for ancestors). Sesame is available in two colours, white and black. Ellu podi is mostly used to prepare Ellu Sadam and Ellu Sevai. 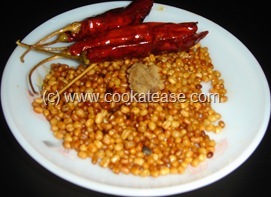 Wash and roast sesame in a dry pan till it pops well; fry asafetida, urad dal and red chilli in in a few drops of oil; allow it to cool. In a mixer grind well asafetida, urad dal, salt, red chilli, then add roasted sesame seeds and grind it partially; now aromatic sesame podi is ready to be mixed with cooked rice/sevai to prepare Ellu Sadam and Ellu Sevai. Serve with any vegetable kootu, chutney and papad. This can be prepared with white sesame also but black is good for health. 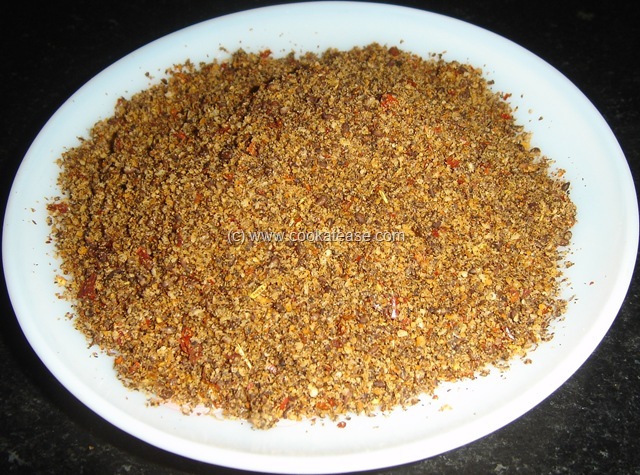 Healthy and such a flavourful podi..
Super podi. Do you live in Nanganallur?You seem to know the temples there. Hey… Podi Looks awesome. Can you pls tell me how many cups is 50g of sesame?